The first reading for today’s feast is taken from the Book of Daniel. This book addressed the people during a time of fierce persecution. The book taught the people that the events of their history and of their present suffering form part of God’s plan for Israel and the world. It also taught that part of that plan would be God’s intervention to restore and deliver Israel. The first part of the book contains stories that are meant to teach and edify. In the chapter we read from today, the style shifts to that of Apocalyptic visions. The visions speak of God’s intervention in human history and the ultimate defeat of the “beasts,” pagan empires that have oppressed Israel. This passage relates a vision of the heavenly court and speaks of a glorious figure, a “Son of Man” who will establish a new and everlasting kingdom. In the century before Jesus’ birth, many had begun to associate this passage with the coming of the Messiah. And the Christian tradition made the connection explicit, asserting that Daniel spoke prophetically of Jesus. In fact, when Jesus stands before the high priest in the Passion account and is asked whether he is the Messiah, he responds by quoting Daniel: “you will see the Son of Man seated at the right hand of the Power and coming with the clouds of heaven” (Matthew 26:64). The pairing of this passage from Daniel with the account of the transfiguration links Daniel’s Son of Man with Jesus. On a more subtle level, there is a lesson about context. It teaches that the events of Jesus’ life and ministry form part of God’s plan from the beginning. No matter the fearful events, God is sovereign, as today’s Psalm reminds us, and God will overcome all evil. Even the devastation of the crucifixion will not stop God’s desire to deliver and save. Just as the “beasts” that oppressed Israel in the book of Daniel were overcome, so the “beast” that is evil and death is overcome by the one who stands before us in dazzling white. The second reading, from the Second Letter of Peter, also speaks of the transfiguration. The letter responds to those who reject the promise that Jesus will one day return in glory by reminding the recipients of the experience of the transfiguration, when a glimpse of that glory was given to Peter, James, and John. The emphasis in this passage is upon concrete nature of the connection to Jesus. There are no clever myths about Jesus, but the testimony of those who walked with Him. This testimony provides the assurance for the hope of the people. The gospel passage is a remarkable moment in Jesus’ ministry just before the narrative turns its attention to Jesus' ministry in Jerusalem. The identity of the witnesses, Peter, James, and John recalls their presence when Jesus raised the twelve year old girl from the dead. And it looks forward to the mention of these same three in the garden scene of the Passion. 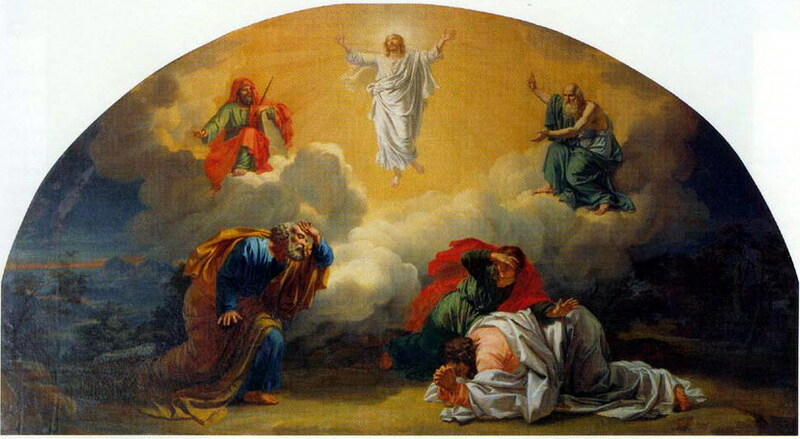 The transfiguration reveals Jesus’ identity to them as the beloved Son of God. Even Elijah and Moses, symbolic of the Prophets and the Law, defer to Jesus. This is also a moment of intimacy as Jesus reveals His inner self to the witnesses. And the power of the revelation frightens them. We cannot read this account of the Transfiguration apart from its links to the larger narrative. Most profoundly, the link between the transfiguration and the agony on the garden reminds us that part of Jesus’ glory is His absolute and total trust in the Father. He knows the lesson of Daniel, that God will never abandon His people to the darkness. Another part of that glory is His divine power to bring life- to raise the little girl and to arise Himself in triumph over the “beast” of death. Like the three in the Gospel, we too are witnesses to His power and glory. Like them also, we sometimes stand in fear before the full revelation of that glory. Sometimes, we fear the intimacy of His love for us. And sometimes, like our Apostolic forebears, we run from the cross. In this feast we are challenged to recognize our intimate link to Jesus, to learn His lesson of utter trust in God even in the face of evil, and to become witnesses to his dazzling light.